The first of September marked the end of the first year of the Ground Truth 2.0 project. With another two years to go, it was time for some reflection, but also for looking ahead. 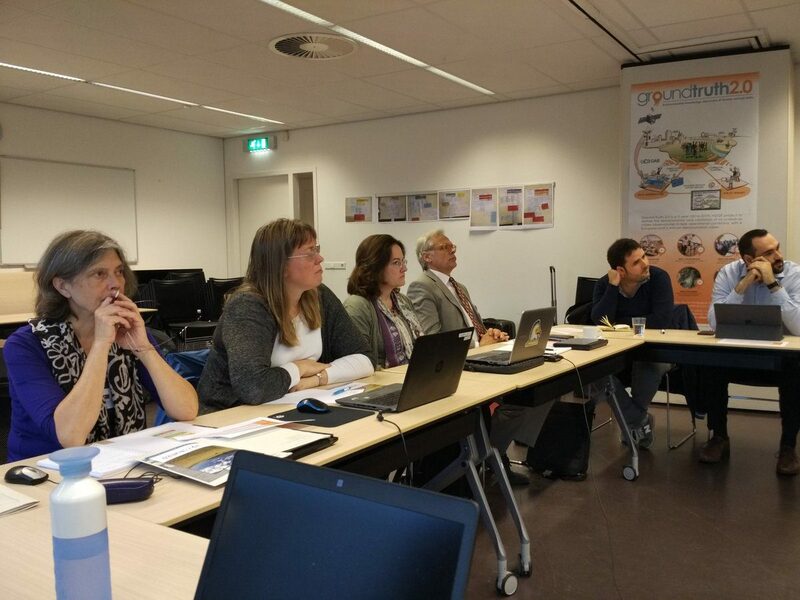 To this end, the Ground Truth 2.0 Advisory Board came to Delft for a full day of discussions with the Project Management Team on where we stand and how we should continue in the years to come. The Ground Truth 2.0 Advisory Board provides strategic advice to the consortium during key milestones. They help view the project from a broader and higher strategic perspective. This allows new ideas to enter the project, but also guarantees that the Ground Truth 2.0 project is ‘grounded’ in the interests of its main stakeholder groups. The Advisory Board consists of six members who have been appointed strategically, with a balanced composition in terms of gender, background and the communities that they represent or are linked to. At the start of the meeting it became clear that the Advisory Board members saw clear links between Ground Truth 2.0 and their own work. Barbara Anton, representing ICLEI, supports local governments to help them manage resources better locally, but within the global context of sustainability. She said, “When it comes to governance and sustainable resources, the theme of green infrastructure is becoming important. GT2.0 ties in closely to these themes.” Clairie Papazoglou, consultant, having worked previously as Executive Director of BirdLife Cyprus, was looking forward to hear how GT2.0 has progressed. She thought there are interesting links to be developed between BirdLife in Spain and the Spanish demo case in GT2.0. Henk van der Kamp, representing the spatial planning discipline, was very interested in how GT2.0 can contribute to better and more participative planning. “If you make a plan for a town, the obstacle is often that people do not like it. So it is in the interest of local authorities to maximize the chances that people will accept it. Citizen observatories can help foster acceptance”, he said. Finally, Liselott Sjödin Skarp, working for the Swedish Species Information Centre, is involved in other citizen science projects and was interested to see how GT2.0 works in practice. There were several topics that came back throughout the day. One of these regards the sustainability of the six citizen observatories that are or will be set up by the Ground Truth 2.0 project. How can we make sure that these observatories will continue once the project stops? Who do we need to make this happen? But also, when do we know that a citizen observatory has served its purpose and can cease to exist? After all, “we shouldn’t aim to make an observatory sustainable just for the sake of it”, said Barbara Anton from ICLEI. Liselott Sjödin Skarp, representing the Swedish Species Information Centre, emphasized that “it is important to ask those involved what they want, and find out their motivations to participate” to make sure that the observatory fits into the lives of citizens, also once GT2.0 has ended. Clairie Papazoglou added in relation to the African cases in Kenya and Zambia that “conflict on livelihoods happens all over in the area of conservation. Finding solutions through collaborative forums is a challenge, and gaining people’s trust is the key to a successful observatory in this context.” Another topic of discussion related to the exploitation strategy for the tools that are developed by the project, but also for the Ground Truth 2.0 method at large. Front row from left to right: Linda Velzeboer, IHE Delft; Conrad Muyaule, WWF Zambia; Clairie Papazoglou, Advisory Board member and consultant; Barbara Anton, Advisory Board member representing ICLEI; Henk van der Kamp, Advisory Board member representing the European Council of Spatial Planners; Liselott Sjödin Skarp, Advisory Board member representing the Swedish Species Information Centre; Uta Wehn, Project Director of GT2.0, IHE Delft. Back row from left to right: Ellen Pfeiffer, IHE Delft; Rianne Giesen, Hydrologic Research; Joan Masó, CREAF; Silvina Tejada Skoglund, Stockholm University; Inge Liekens, VITO; Camille Pelloquin, Starlab; Alberto Masa, Altran. The Advisory Board members provided many new insights by approaching these issues from their own disciplinary and personal angles. This reiterates that it is important to have somebody look at your project once in a while from a different perspective. 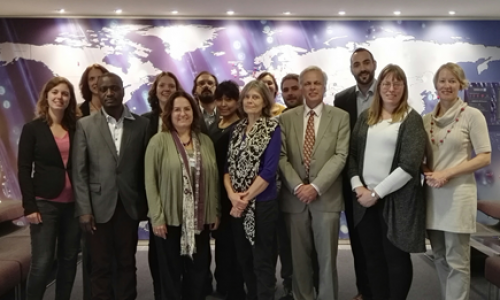 And, as Barbara Anton from ICLEI said: “It is also a nice and privileged role to be an Advisory Board member, as you get to learn about a project and the way they work”. With the new inputs from the Advisory Board, we are sure to start off the second year of Ground Truth 2.0 inspired and ready! Advisory Board members from left to right: Barbara Anton, ICLEI; Liselott Sjödin Skarp, Swedish Species Information Centre (ArtDatabanken); Clairie Papazoglou, consultant (previously working for BirdLife Cyprus); Henk van der Kamp, European Council of Spatial Planners. Next to Henk are Camille Pelloquin from Starlab and Alberto Masa from Altran, both representing the Project Management Team.